Agroforestry systems are a traditional land use practice in Greece. They are widely distributed all over the country and constitute important elements of the rural landscape. They include all three types of systems: silvoarable involving trees and crops grown on arable land, silvopastoral involving trees and pasture/animals grown on forest and arable land and agrosilvopastoral involving trees, crops and grazing animals grown on arable land. Trees may be forest species or cultivated trees grown for fruits, naturally regenerating or planted, evergreen or deciduous; crops may be annual or perennial species; and animals may be sheep, goats, cattle, pigs or chicken. The area covered by these systems is estimated to be more than 3 million hectares or 23% of the whole country. All types of systems deliver a great variety of goods and services and constitute a cultural heritage while the role of trees is crucial in sustaining production and improving the environment in rural areas. Despite their great economic, ecological and cultural importance however traditional agroforestry systems have been degraded over the last few decades due to extensification/intensification processes imposed by socio-economic changes. Hellenic Agroforestry Network (HAN) is a non profit organization established in Thessaloniki, Greece in 2012. Purpose of the Network is the promotion and dissemination of science and practice of agroforestry in Greece. Dissemination of knowledge for multiple values of trees to the environment and economy among citizens, especially farmers. Highlighting the role of trees in creating productive agroforestry systems on agricultural and forest land that is environmentally friendly. The promotion and protection of valuable and diverse traditional agroforestry systems of our country. Scientific support for new agroforestry systems in accordance with the technology and financial requirements of the time. The association has 70 members with various study back rounds including forestry (40 members) agronomy (15 members) biology (5 members) and farmers (10 members). The high participation of foresters is due to the fact that (HAN) introduced in Faculty of Forestry and natural Environment of Aristotle University of Thessaloniki. It is estimated that the number of farmers will rapidly increase with the application of Agroforestry measure this year. The HAN has organised various meetings with farmers associations and stakeholders like young farmers association and also more than 10 day-conferences for the Agroforestry introduction and its benefits across the country. In addition, the HAN publish 2 newsletters per year with the latest news, projects and issues related to Agroforestry. HAN is also in close collaboration with Ministries of Energy and Environment and Agriculture and Food in order to prepare the Agroforestry measure. 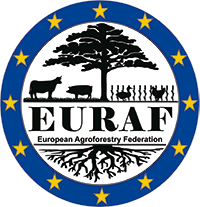 In the previews period of CAP (2007-2013) article 44 of Council Regulation 1698/2005 supported the establishment of agroforestry systems. Among the first countries accepted the Regulation was also Greece and prepared for the implementation of the measure. Unfortunately, the wild fires of 2007 in Peloponnesus destroyed large forest and agricultural areas and money needed for the landscape recovery. Then, several agro-environmental measures including agroforestry were stopped or delayed. Later, in 2011 article 44 of Council Regulation 0282/2011, agroforestry establishment in agricultural and forest areas was supported. According to the specific regulation establishment costs for the new measure included a) Establishment of agroforestry system by planting trees in agricultural and forest areas, b) Establishment of agroforestry system by felling, thinning or pruning trees of forest areas in order to create silvopastoral systems. Greece accepted to apply the measure but only for the establishment of new agroforestry systems in agricultural and private areas grazed by animals. The measure was included in Forestry Measures with code 8.2 according to National Regulation 1940/12-7-2017 and was to be implemented by Forest Service. The total support was decided to be 21,000,000€ for an area of 2,000 ha.